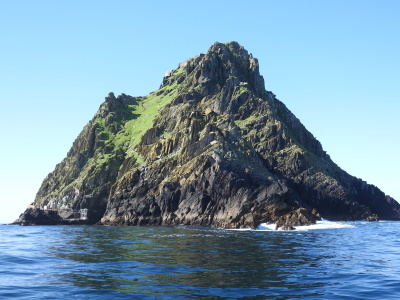 Sceilg Mhichíl (Skellig Michael) is an early monastic complex on a difficult to access, steep rocky island. The island, also known as Great Skellig, lies about 15 kilometres west of the coast of County Kerry, Ireland. 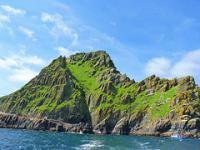 It is the larger of the two Skellig Islands. For 600 years the island was an important centre of monastic life for Irish Christian monks. An Irish Celtic monastery, which is situated almost at the summit of the 230-metre-high rock, was built in 588. The very spartan conditions inside the monastery illustrate the ascetic lifestyle practiced by early Irish Christians. The monks lived in stone 'beehive' huts (clochans), perched above nearly vertical cliff walls. The buildings on the island consist of the Monastery (including an oratory and St. Michael's Church) and the Hermitage. When we departed Portmagee we couldn't yet see the island, just the top. While we made our way the island kept rising from the sea and we felt as if we had entered a fantasy story. Think Mordor in Lord of the Rings. I had tied me getting tickets for the island to a friend's proposal to join him on a road trip of Ireland. My friend was aware of my peculiar priorities in travel, so he understood. And when we stepped off the boat onto the island, he fully appreciated the efforts I had invested into getting us there. The island now houses plenty of birds that don't seem care much for those few pesky visitors each day. We got to see plenty of puffins up close. They also left lasting nasty imprints on my rain coat (definitively recommend to bring and wear). Apart from the birds, during visiting season there are also several guides on the island. They will provide some background information on the birds and monks. It's fascinating imagining the monks rowing out to the island and living in their beehives. To me it's a bit weird that this was inscribed only as cultural site. The remoteness and the landscape were key reasons for the monks to settle here. You also now have a unique bird sanctuary. If this doesn't justify a mixed inscription, I don't know what should. No matter what, this is truly one of the great sites of the list. Thanks to recent Star Wars fame getting onto the island has gotten infinitely more difficult than it had already been before. Apparently, loads of the 180 places (15 boats with 12 passengers per day) are reserved one year in advance. Some operators, though, only open reservations in March for the year, so this should help. In any case book as early as possible. Season runs from May to September. For the rest of the year landing on the island is not possible due to the rough seas. In my case, I visited in shoulder season (end of May), but still had a hard time getting two places on a boat three months in advance. I ended up contacting multiple operators via mail. After an additional phone call with Pat and Pat taking out his notebook and marking me down, I had my seats. And just to be on the safe side, I called a few days in advance to confirm. I don't trust oral confirmations all that much, but all worked out fine. By the way, Pat was complaining about calls from all over the world at very strange hours, so be mindful of the timezone difference. Lucky for us, Pat owns the fastest boat and even though we started late we were the first at the island. To get a seat you may have to be flexible on your dates. You should contact as many operators as possible. Those that have a website (not paper notebooks) sell out the fastest, so your best bet may be to call up those that don't. If you call, do this during normal hours for Ireland. In the case of Pat, his office hours were in the evening or while his passengers are hiking on the island (11:00 GMT). Turns out there is cell reception on the Skelligs, at least in some parts. You may also want to try operators not departing from Portmagee. I think there are 1-2 other ports from where you can take the tour. If nothing else helps, you can always take the ecotour. You will miss out on the monastery, but still get a look of the pristine land- and seascape and the birds. Finally, not all hope is lost. On our boat we had two passengers who had booked the same week. My hunch is that if you go to the pier before the boats depart (9 a.m.) and ask around you may get lucky that day or a few days later. I am not sure how many no shows they have, but it must be some. Supposedly some customers reserve multiple consecutive days to be on the safe side. We came the night before by car, the preferred mode of transport for the area. I think there are also daily buses to Killarney I presume, but you would be missing out a lot without your own transport. In Portmagee the boats all depart from the same pier. At first, it's a bit confusing, as most boats depart around the same time, so it gets quite busy. But the operators are a close knit community so you can just ask around. Indeed, the locals all know each other as we had found out the previous night when having dinner at Fisherman's Bar and Skelling Restaurant "Ah, you are going with Pat from Waterville?". The restaurant comes highly recommended. They are situated just in front of the pier and the sea food platter is epic. The island has no toilets and the boats only have an emergency one. So it's best to take care of that before you board the boat. There is one breakfast place in town, so grab a coffee and make use the opportunity. On the boat you will get rain gear if you haven't brought your own, and the usual safety gear. The rain gear is compulsory as you will get quite a few showers along the way. Portmagee is on the Ring of Kerry, one of the classic drives in Ireland. On the Southern side of the Ring of Kerry you can visit one of the stone forts (Staigue). While Staigue is interesting it's Dan Aengus on the Aran Islands you want to visit. You will also drive through Killarney National Park, a former site. Apparently not WHS material, but it's still pretty nice. If you are on a road trip, driving to Dingle Peninsula is a must including a stop at Inch Beach, one of the prime surf spots of Ireland. Looking on potential sites and near misses for me, Valentia Island on the other side of Portmagee is planning a submission. The first transatlantic telephone cables were laid here in the 19th century. I visited this WHS in July 2012 and I was lucky to pick a sunny day in the usually rainy Summer in Ireland. The only way to visit this site is on one of the few fishing boats that have a permit to land 12 passengers each on the remote island. In the past, this WHS was considered to be the most remote place on Earth! After braving the high waves of the Atlantic Ocean for about 50 minutes (one-way), I arrived on Skellig Michael. Close to it is the jagged Little Skellig island with a colony of around 200,000 Northern Gannets. 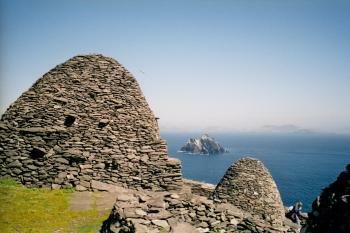 On Skellig Michael, I climbed 600+ steep steps (with no railings) which led to a 6th century "bee-hive" monastery. Hiding in burrows all over the island were thousands of cute Atlantic Puffins, Razorbills and Guillemots and basking in the sun on the rocks were some seals. This WHS is by far my favourite so far even though less famous or grandiose than the Pyramids of Giza, the Taj Mahal or Petra! The Trip to Skellig Michael is a must see if your visiting Kerry. The views are breath taking on the walk up and even more spectacular on the way down. If your carefull and watch what you are doing at all times the walk up is within the capability of most people. The walk up is a series of stone steps which can be uneven and different sizes and shapes. Care needs to be taken on the steps at all times. My aunts who are in their early 70's walked up all the way to the beehive huts. They took their time with plenty of short stops to catch their breath. My advise about the boat trips would be to do a little searching on the web before booking your boat operator. The shortest route is to go from Portmagee. Most operators take 45 minutes either way from Portmagee, however there is one operator who takes 1 hr and 10 mins from Portmagee as he has a smaller engine boat. He shall remain nameless. If you enjoy a longer boat trip then there's no problem but personally, 45 mins is enough for me on a small boat. Despite what some reviews are saying, I did not get a drop of water on me on the trip out. If it's calm, you will not get wet and the boat operators generally wait for relatively calm sea's because of the problem of docking at the pier. b) it's a summer-month thing, between May to September are the only possibilities and even then you need to be lucky with the weather to get a day when the boats can actually land on the island. I accessed it via the village of Portmagee which is just off the Ring Of Kerry - like others on this site I heard great things about Des Lavelle (who is a local historian and who is based there) and therefore pre-booked with him, by phone - however when we showed up the day before they claimed not to have heard of us and to be fully booked out, wasn't too impressed with them therefore. My experience of visiting this site was absolutely fantastic, visiting World Heritage sites can take to the end of the earth, which is almost literally where Skellig Michael was when it was first inhabited. It was to these monastic retreats on the edge of Europe that the western Christian church effectively retreated to after the fall of Rome. Skellig Michael is the larger of the two Skellig Islands situated some 12km off the coast of County Kerry, and it is home to a small monastery founded in the seventh century. The bulk of the monastery is on one of the islands two peaks and consists of a few small enclosures and several beehive cells (pictured)which the monks lived in year round. Whilst the remains are not massive they are impressive and more considerable than I imagined them to be. It is their setting that makes them spectacular though, they are perched atop a rather large stone hill surrounded by the Atlantic Ocean. This setting also makes them a fair challenge to get to, the climb from the base of the island is much more precarious than I had imagined, though the accompaniment of a few puffins made it more enjoyable. The dry-stone stair way meanders up the side of the island, at times leaving only sheer cliffs between you and the Atlantic, and as it was originally laid some 1000 years ago it does not provide such modern luxuries as guard rails. This is not a climb I would recommend for a casual afternoon stroll. For me the climb was worth every single moment as the top was breathtaking, the natural setting alone was worth the effort, and the monastery just made me euphoric. On the other peak there is another small collection of beehive cells, as well as a hermitage, and it is very strongly advised not to visit these, although some people did attempt it once I saw the crossing I could not find the stomach to even contemplate it. The boat trip out there takes about 1h 30m and be prepared to get very wet, even on calm days. It takes you past Small Skellig (island in picture) which is a birdwatcher’s paradise. Europe’s second largest colony of Gannets dive down from all around, accompanied by Puffins, Guillemots, Seals, Dolphins and a whole host of others to keep you entertained. Mainland Kerry is also pretty spectacular, especially the drive on the Skellig Ring between Ballinskelligs and Portmagee. The later is the best place I think to head out from as the Skellig Experience museum is there and it is also the home port of Des Lavelle the very friendly and endlessly informative historian of the island, I would recommend hunting him out. In 2006 it cost €40 for the trip giving you about 2 hours on the island enough time to get up down and have a picnic on the way. This shows the joy of visiting UNESCO sites, without its listing I would probably have never heard of it but my visit was one of the best experiences I have had. I rank the sites I visit out of 10 and this one received a 9, not bad as only the Grand Canyon and Rome received full marks. If you are reasonably fit, have a few days on your hands, and a bit of nerve for the climb I cannot recommend a site any stronger than this one. Skellig Michael is a tiny island and you have to go there by a small boat, the joutney takes about an hour and the prize is a steep 35 euro but I manged to get it down to 20. The island rises 240m from the sea and you have to climb stairs all the way up to top to visit the very well preserved monastery. Skellig Michael is inscribed by UNESCO as a cultural heritage but the natural beauty and the wildlife is even more stunning. Puffins and other birds have their nests everywhere on the island. They dive out from the cliffs and seems not scared at all by the humans. There is a lot of tourists on the island even with the remoteness and the high cost to get there. But it still is a very special and beautiful site, one of my favorites so far. It was brilliant! I have never seen anything like it! Idid a guided tour of the island and found out so much. If I could do it all again I would! 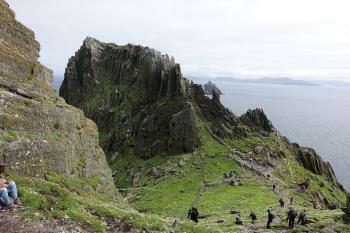 Star Wars: The island served as a location for Star Wars: The Force Awakens, and is featured in the film Star Wars : Episode 8 The Last Jedi.